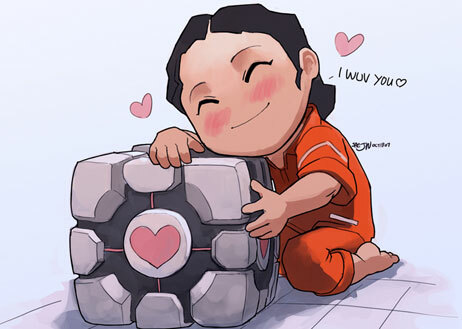 Portal 2, Worth the Wait? I picked up Portal 2 at the release and quickly fired it up to see what it has to offer. And, to answer the title question, yes it was worth the wait. Though by wait, we should first look at Valve‘s innovative release system using the potato sack. Essentially, you could pre-buy the game bundled with a bunch of Indie game titles selected by Valve from the steam library, and the more people logged into the games the closer Portal 2 would come to being released early. So, release mechanism aside, players of the first Portal game will know how it plays, and in short I will say to you guys, stop reading here because, honestly, the game is more of the same procedure. It feels and plays the same as before, though the look of it has gotten a little more polish since, as you might expect with the passage of time and Valve’s evolving Source engine. Well, ok there is a little more on Portal 2’s table I guess, so keep reading a little longer and I will tell you where to stop. I will not go into the story of the game as it will give it away to people who have yet to play it so instead I will focus on the basic intro for unfamiliar heathens or people living under the various rocks on the internet, and the features inherent to the new game as well as the old. Essentially, you can create portals with a special gun that fires one blue and one orange circle against certain types of walls and other surfaces. The portals connect together and you step through either one to come out the other side. The levels are based on puzzles where you have to use portals as well as other apparatus to solve the puzzle or get past obstacles. Many of them are simply a case of putting things where they should go and getting power to switches to open doors, but others are more crafty requiring timing. on your part where you get things not quite in place, stand where you need to be and then fire up the portals. You can use them to leap around too, where surfaces are angled or high up, and dropping into one portal quickly from a great height or by other means of fast movement will cause you to be launched out of the other portal to a platform or wherever you need to be. If that means another surface you need a portal on then you have to be quick about putting it down as well as your exit portal again. You see, you can only have one blue and one orange one open at a time. Some buttons need holding down by an object to activate something like either a laser or a door that needs to stay open. Sometimes you have to dodge or knock over turrets that have rather cute and creepy voices when they detect you. It is especially creepy when you do knock one over and it shuts down saying something like ‘I don’t hate you’. So that pretty much covers elements brought from the first game. The new stuff includes the use of gels that have effects like making the floor bouncy, or enabling you to run very fast where the gel covers. The final kind of gel lets you create portals on a surface that would not be able to hold a portal otherwise. Near the end you become familiar with bombs that are ejected through tubes and, of course, you can use a portal to send them somewhere if you need something blasting. Turrets are still there, though you will see some eventually that are faulty and they are a comical sight to behold. Another new challenge comes in the form of excursion funnels, which is a tunnel of swirling energy that moves anything inside it slowly in a direction it is set to. These can be routed through portals too, as can the hard light bridges which can also block turrets. For the achievement hungry you will be delighted to know that there is a nice list of them, most of which you have to earn rather than just using them as markers to track your progress through the story. And about half of them are based on the new co-op game play mode where you solve puzzles with a friend over Steam. So, the story. Because I am sure new players are asking themselves if there is one. Well, there is, and before you play this one you should really play the first Portal game and get to grips with that story. In short though, you are the ‘guest’ of Aperture Science and the remote AI in control of the portal testing facility. Though it seems the point is less about testing the portal gun and more about testing you. As you play through you make a bid for freedom into the back passages of the empty facility trying to flee the AI. I won’t spoil that story either but I will say that the AI’s constant chatter is amusing and will provide you with some of the best quotes of the game. And on the occasion where you poked your head out of the internet rock, if you saw things like ‘the cake is a lie’ you will understand where that came from finally. So this story carries on from the second portal ending and gives you a new character to enjoy the company of, and he is a hoot. The writing is well done in this regard making me chuckle many times as I play through. But it is not only the chuckles that makes the storyline so good, as you get a good chance this time to really delve into the past of Aperture Science with some startling revelations about many things, as well as how history seems to be more of the same of the current situation. There are further tributes to Black Mesa from Valve’s Half Life games, lending to the opinion on my part that these events are taking place alongside the events of Half Life 2. Here is a good thought for you. Is the Aperture Science testing facility running on autopilot deep underground while the Combine have taken over the Earth above the surface, without them even knowing what is beneath them? The puzzles that you are thrown into are as cunning as ever with the new mechanics, and the set pieces that smash together in some parts and break into pieces are well rendered in a manner almost like Geomod used in the Red Faction games. Even if on the whole the scenery breakages are pre-set unlike the more active dynamic system Geomod uses. Also you encounter….. well, it’s hard to say this without giving much about the course of the game story away so I will try here. You encounter different kinds of test environments too. Some of them are pretty old… some of them are not so much tests as smashed bits of tests stuck together in haste and a little chaotic but they still manage to pull of a challenging test platform. These touches, as they relate to the game story, are pretty great in my opinion and are as much a means of enhancing the story telling as the events of the story are themselves. Also a good amount of work has been done in making the old facility look broken and derelict where needed, and the place is putting itself back together as you go through, which is a nice touch when you come across the adjustable plates that will not go back in, and keep failing to align. It’s been all good so far so you are waiting for the bad here and it is really hard to find any at all. Overall the concept of the game play is so simple being focused on the one play mechanic package so it makes for a good game. I guess if I had to strain I would say it is a little short. Around 6-8 hours is an average completion time for the game in total, even if there is some re-playability here once done. You can select your chapter and go again hunting your achievements. Though you will not find the puzzles a challenge a second time round since you will know the solution by now anyway and it will be a breeze. The only other thing worth replaying for is the comical dialogues. Sure you have a co-op mode to carry on with, but even this will get old eventually unless there is new content in the works like another map package. There is a DLC link on the steam library for the game when you buy it, so I can assume there are plans there but I have not done any digging yet to find out. Overall that is a very small gripe about Portal 2, and not one I will indulge in taking to heart as the brevity is a good thing given the aforementioned simple play mechanic package. It gives the game some small leeway in prolonging the story as a story in a game is still just a means of delivering situations where you use a game mechanic or several of them. There is no driving portion of Portal 2 like there is in games such as Gears of War or Half Life 2 and the subsequent episodes. There is no need to harvest resources or collect keys scattered over the game map. There is no strategy element to control or epic story arc involving many characters and a huge war. A game like Portal 2, dragged out for as long as any other current title, would get laborious and be nothing more than a fancy version of some brain training game like you get on the Nintendo DS. Should you buy this game? Of course you should, what kind of question is that? Ohh and by the way, earlier I mentioned I would tell veterans where they could stop reading after I gave them all they need to know. As you can see, I have not done this. This was an intentional lie designed to test your levels of trust. If you are reading this then you have completed the test and helped further advance the cause of science. Aperture Science would like to thank you for your participation and, to celebrate, there will be a party in the next room, and you shall have cake. One Response to Portal 2, Worth the Wait?